June 30th and July 1st are the best days to see Venus and Jupiter come together in the night skies. Both are usually bright and can be seen on a clear night, but when they conjunct - seeming to join - their luminescence will be gorgeous! Venus in Leo is a mix that loves to express itself and can have a regal or dramatic appearance - think glamour. They love themselves and they adorn themselves with beautiful clothing, jewellery and surroundings. They can be demanding of their spotlight and will hold that space to entertain or lead others - if they want to of course. Jupiter in Leo will act even more magnanimously. Jupiter expands anything it touches, so in Leo this exaggerates the traits we all know as Leo - funny, witty, centre of attention, performer, actor, courageous and bold, risk taker to a degree, confident, brassy, here I am world! When these two come together you have a very high vibration of optimism and nobility possible. We may see a double life of the party energy, a sense we can do something above and beyond our usual capacity, an expansive feeling that can promote bold actions and generosity. At any rate it is a lovely aspect and I wish everyone a positive manifestation this week. June 21st the Sun moves into Cancer for the solstice, the birth of summer. Do you know much about this mystical sign ? You will feel it soon enough with the Sun, Mercury and Mars in the sign. Cancers are said to be the deepest of all the signs. They represent the Imum Coeli - the bottom of the chart. Cancers will FEEL their way through every situation. They remember or are imprinted with stories, news, information in an emotional and photographic memory type of way. They may not be able to cough up the dates and times or facts of a situation, but they WILL remember all the subtle nuances of the situation and will have empathy for the people involved, have imagined what it's like to walk in the other's shoes, and will have synthesized their assessment based on all these levels combined. Sound complex ? they are! Cancer is the sign of the Mother. Men and women are parental toward others. They are either the child or the parent in every situation - not as easily the equal. They need to nurture and be nurtured. Cancers are known for their distaste of conflict as well. So when Mars -planet of action, passion and aggression- is in this feminine sign, it isn't comfortable or well expressed. Cancer will hold everything inside until they blow up, flip out, panic or cry etc. They won't just tell you straight up like an Aries, or Capricorn. They won't be diplomatic or weighing all sides like a Libra. They will absorb all the data and emotion, hold it all in and mull it over as to how best to help or save the situation without conflict. Sometimes they achieve it. They can artfully show so much tenderness that it can diffuse a fight. Or, if this fails, they just might go from calm to super diva - scolding or listing everything they have kept in the storehouse unsaid. Mars in Cancer is deep and indirect. Like the crab in Nature, it moves sideways. This says everything about their conflict and communication style, as well as the way they go about getting what they want. They don't go for it directly - they manipulate the situation to suit their needs...very well. It can take a long while to see through this aspect because at first they will make you feel that you wanted the same thing they do, or that you were consulted...but you really weren't. They feel out all sides, and suggest things here and there, maybe use a splash of subtle guilt, and voila! it all happens on their schedule. It's sort of like the more sophisticated version of watching your cat sniff all around the room feigning curiosity when you KNOW they are coming for your plate. To really make he best use of a period of Mars in Cancer, its' good to remember that people will be emotionally motivated. They will have an agenda and won't say it outright. They will be needing more care and tenderness than usual, and may also be willing to give this more than usual as well. Philosophical conversations are more possible as they love to delve deeply into a subject - in privacy with someone they trust. Intimacy is the nicer possibility of this aspect. If you are dealing with someone who is being outright manipulative or passive aggressive though - and you surely will during this transit at some point - the best solution is to state your boundaries clearly and quickly, in a easy going casual tone at first. Be friendly but don't allow any games to start that will be hard to untangle later. Neptune is also retrograde now for the next six months, making this a summer of delving deeper and trusting our intuition to guide us more than ever. This new moon in Gemini is special because Mars is in Gemini as well as the Sun and Moon! Gemini is a curious fellow. They have to know what's current, who's with whom, the latest facts on global warming, and they have to keep up with all the ideas in their heads. This sign wants to do five things at once and is usually able to pull it off. They know many people and can adapt to whoever they are with, which then becomes exhausting so they need down time. It can be extreme to those who want to be close to them. Social butterfly and then cave man. We may find our own dual nature comes up to be seen when these planets align. We all have our masks. Those times we have to be ON for work, or perform in some way. We may want to examine them for the New Moon period and adjust how much we play roles that no longer fit. We will also want to watch for our aggressive side with Mars as well. Mars and the Moon together can be very passionate, moody or downright bitchy. It can create intrigues, and gossip. It can be a deceptive combination sometimes or a self sabotaging aspect at times. It's only a short influence so we just have to keep our patience in check and not get too excited before checking things are what they say they are. The Full Moon is in Sagittarius this June 2nd at 12:19 EDT. The full moon is always opposite the Sun, so while the Moon is full and accentuating the emotional realm, it also opposes the masculine side and pushes and pulls us around. Sagittarius is the sign of the philosopher and world traveller, savvy in worldly affairs and has an opinion on almost everything, and they will often be right. They have risen from the depths of self examination and solitude to see a piece of the truth , and they are more than ready to tell you what they see and think. They are optimistic and expansive and need their freedom. When the moon is full here, these qualities are intensified. Gemini is the sign of curiosity, duality and adaptability. They can shape sift to suit any person or situation if need be. They usually have a distinct inner and outer personality and world. They will often be a social butterfly only to crash and need utter solitude to re-balance themselves. They can be black and white thinkers despite this insatiable curiosity because they need to see the world through a "rational" lens. emotions are too uncomfortable and messy. Sagittarius isn't afraid of emotion, but they don't dwell there. They like action and passion. Gemini is multiple, Sagittarius is singular. Yet both are mutable =changeable signs. This makes this full moon a bit easier to manage since these sign s can both change and adapt if needed. The main message I am hearing about this full moon is to stop faking it in your life. Check to see where you wear a mask, even if the mask is being sure of yourself ;) Check to see where you are nodding in agreement when in fact you don't. Look at where you are spending time with things or groups that don't really fit your deeper values,even if they are interesting. At some point we must pick something - including our ideas, opinions, and philosophies - and stick to it. awake we have been to it in the first place. body will tell you what is the right thing for you to do. Every three years we are presented with a new lesson period from Saturn. It plays out for everyone, no exceptions. We will feel it in the air on the news, in our cultural tastes and topics, and in the policies brought forward that affect us. Saturn is the great teacher adn time keeper - Chronos. This influence has the effect of us feeling tested, restriicted, or dampened in some area of our lives. It is ever ongoing in our lives as well - it just changes sign and house in our own charts, switching from one area of life to the next and with very different qualities. When it shifts sign it's a big deal, because the next three years of our lives will be affected in that area. Sagittarius is the sign that follows Scorpio. IN Scorpio we dig to the bottom of everything. We leave no stone unturned and we seek the truth no matter where it leads us. It often leads us into the murky shadows of ourselves and human nature. We have had to deal with very graphic and gruesome world news under its' influence - dismemberment, beheadings, children stolen and used as suicide bombers, gang rapes, the fall from grace of cultural icons due to sexual deviance and violence and terrifying Ebola outbreaks. It's a very dark and depressing aspect of mankind to understand. So Scorpio leads us down that well of ever darker more mysterious psychological and spiritual realms until we hit some sort of bottom. When we move into Sagittarius, we have seen the bottom, we feel we have seen the Truth ( according to us) and we re-emerge to share it. We may say it loud and proud and with full certainty that we have THE way to live. Before we get to the podium, the best selling booksehleves or the nightly newscast, we will have had to do some research and study, return to higher eductaion, undergo very intensive personal reflection, and have seen the world from a larger perspective. It is here we witness how the individual has come by their knowledge, by what values they will live their lives, and by what philosophy we "should" re-order society. Sagittarius isn't so much interested in the work of restructuring - we leave that to the Capricorns. They are interested in shaping the guiding ideas, morals, and ideologies to guide society forward. This is the birth place of the Guru, the Extremist, the Explorer and the Truth Teller. We will be seeing more of these emerge, and we will be seeing their validity under Saturn's scrutiny. If someone's message is false it will likely fall apart. There is another result though, that they hold on by more oppressive means like a toddler who has been told,"No". In practical terms it may mean more sects and centers and churches or mosques being built. IT may mean more political arguments on Facebook. It may help you align with people whose ideas you do passionately align. It may bring more Self Help and How To books. IT could lead us into more battles that are religiously motivated. It could lead to more debate or challenges to freedom of speech ( the Je Suis Charlie murders occurred the week Saturn went into Sagittarius) It might bring concrete education reform. We may see reform or more laws around internet use, travelling, publishing, and religious self expression. We have already had a large taste of this while Pluto was travelling through Sagittarius from 1995 to 2008. If you want an idea what may occur we can look to that time frame in our lives and on the global stage. Pluto is a more difficult energy than Saturn, but the themes will be similar. Saturn has more potential to bring order and structure to things than pure upheaval. If you want an idea what may happen in your personal life during this time you can go way back to 1985 to 1988. What was changing then for you ? How did you handle it then ? If something pops up again from that time are you ready to shift your way of seeing it ? find closure? or accept round two ? You can also look at what was being thrown into question from 1995 -2008. Now Saturn will come along for a much shorter window and with some patience and discipline you can have a victory over some of those repetitive issues. We so often try and try in life. We bang our head against the walls of our own and others resistance. We want to help, or think we're helping or saving someone. But there comes a time when you truly have done your best and must accept this and move on. In early University at Queen's in Kingston, I was living with my first housemates. Six of us went from our parents homes, to dorms and to a house all within a year's times. That in itself is a big adjustment. We all brought our values and ideas to the place, but of course it was all unconscious - so the divisions began and got worse. By the time four months had gone by, there were rules about the fridges, and people sharing groceries but only with so and so, and TV squabbles - on and on it went. I was feeling very alienated since it was me who brought the gang together, found the house, cleaned it and brought all my basement furniture and kitchen supplies from home. I was so torn about what to do I turned to my professor - a true spiritual teacher - and said, "Sir, how do you know when you should go back in and try harder and when you've done enough? He sort of stopped in his tracks and said, " If you have given it your very best and you're still not happy, by all means get out " It was the affirmation and perhaps permission I needed to let go of the situation. I told my own parents of my plan and made very quiet phone calls to other apartments. I was so scared they would all find out and come down on me even worse. It go so bad at one point that my former close room mate was angry at me over something petty and decided to invite my ex boyfriend over and kicked me out of my own place. I had been scapegoated, although I really didn't' see it until years later. I found a place and moved all my stuff out of there. I'm the type who will endlessly try and reflect and self blame , just in case it truly is my responsibility or fault. I don't want to run away from life, and I don't 'want to give up on anyone if it's workable. But being left out to such degree was too much for me to fix, especially at just 19 yrs old. I never regretted that decision and my life got better from there. If you are the sort who easily moves on then you may need to reflect in the other direction of why you don't try harder. However I'm"sure most of you reading this are the other sort like myself and have trouble knowing when you've given enough, tried enough and when enough is enough. It's never easy to call it a day. Responsible sensitive people tend to feel like failures for walking away from something or someone. But I say to you now as my professor did - have you given your all and you are still not happy ? Let yourself walk away. This is where faith comes in as well. We have to Let go and let God. We all have certain thoughts that get us through life. Some help us or have their own mysterious ways of working things out for us. Others keep us locked in deep conditioning and play on repeat like a scratchy record. I believe that there are certain thoughts we need at different times in our lives to grow. One example of this I'm sure you will recognize is when someone talks about a situation that is obviously painful or complex and say, "I don't' care". Well, that's BS and we all know it. So do they deep down, bu for that timing in their lives it is needed as a mind set to detach them and help them carry on functioning - or it's used to keep themselves away from taking responsibility. At any rate, it is a chosen mindset. When I was detaching from a long term relationship where I was taking on too much responsibility for them, I needed to remind myself over and over - its' not mine to solve. This was counter intuitive to my nature at the time. I always feel what others want and need and usually jump up to give it to them. In this case, after soul searching, I needed to leave this relationship. IN order to negotiate the timing and feel my own feelings around it vs theirs, I had to practice staying with myself and detach from their issues. It was tough, but it got me through it and even to a graceful parting of ways. To think this way wasn't my true nature, nor did it feel real to me yet, but the mind set of those thoughts mirrored what I needed to complete the process well. like our survival is at stake. great mindset and though pattern that brought you what you needed or wanted ? This is true manifestation ! Emotionally and mentally in line with a positive outcome and desire. I love this excerpt from The Tao of Pooh. This is the mindset that changed my life. I rad it almost 20 years ago and the underlying philosophy that life could work without trying so hard, without strife....was mind blowing and SO comforting to my soul It flew directly against everything I leaned growing up. It gave me true peace. It also allowed the period where my intuition grew the most. Trusting that things happen when and as they need to...without a sense of deserving it, or being punished if it isn't... without being afraid something will be missed if I'm not a work-a-holic, or hyper-vigilante...that I could access a side of life and myself that allowed a smooth ride and enjoyment. WOW! When I have drifted off into my old habits and then return to the Tao, life always deepens, calms and improves. We all make better decisions with a calm mind that is not judging. This is the mind set that gets me there. What is it for you ? Solar flares affect the Central Nervous System (stomach lining), all brain activity (including equilibrium), along with human behaviour and all psycho-physiological (mental-emotional-physical) response. Solar flares can cause us to be nervous, anxiousness, worrisome, jittery, dizzy, shaky, irritable, lethargic, exhausted, have short term memory problems and heart palpitations, nauseous, queasy, and to have prolonged head pressure and headaches. This year I have become very aware of the phenomena of solar flares. I was experiencing sudden symptoms and intense waves of energy or the lack of that were inexplicable otherwise, since I am healthy. I started to read more anecdotes on certain spiritual sites that all spoke about the solar flares and their symptoms on those days as well. For many of us it will hit as a giant headache. For others it will play out as vision disturbances, and for others it will be aware of utter exhaustion, or palpitations and extreme moods. At first I thought, how can we all be so affected by this - but our sun really is THAT powerful and so are the magnetic waves that are activated. Some cases in history have seen this space weather disable satellite signals and here in Quebec it even disabled our Hydro Quebec functioning in 1989. I wanted to write about it so you too can keep track of the solar flares and will take care of yourself. We all tend to think, " Its' just me," when we feel bad. It must be because work is getting me down, or because it's winter, or because we're not in the best shape etc. Well, sometimes - probably more often than we care to admit - it is a collective experience of universal energy we are responding to. Don' t blame yourself automatically. Mars is the planet of action, passion, impassivity, taking charge, physical action/exercise, adventure and yes, war. Libra is ruled by Venus, who wants everything to be peaceful, harmonious and fair. You see the dilemma ? We have our planet of war in the sign of peace. On top of that Mars is in retrograde motion - slowing things down and making them more introverted. Libra isn't known for it's decisive qualities, it prefers to mediate and draw attention to all sides, especially the underdogs. Mars wants to decide quickly and forcefully. So we are headed for a time where no one is going to be very decisive, or arrive at any true conclusions. It will be a time of more passivity, LOTS of talking about it, and a very strong forces on trying to make things more fair. When our planet of action isn't well dignified we can also expect to see actions of "social war". This energy of not wanting direct conflict, and perhaps dragging out decisions and discussions can be very frustrating to us. If you think you can benefit from things stalling, then Mars retrograde may by you some time to think. If you are raring to go - as the Wood Horse Year will want - we may be frustrated and have to go about things differently. At best - we can use this time for further reflection and socialize our way to our goals. At worst we can expect some passive aggressive energy, and a wishy washy attitude toward commitments. but Mars in Libra will seldom accept this notion. they stir others up with their desire to balance everything. and can generally charm the birds out of the trees to win your favor. Passive-aggressiveness is practically the hallmark of this position. and they fight for Libran justice and fairness in the world"
Depending on your own sign and tendencies, you may really enjoy this phase or it may be time to lay low. If you are a fire sign you may be happier bypassing the crowd consensus when you can - or just go off on your own. If you are a water sign you may want to retreat and listen vs share, intuiting when the tides will shift instead. Trying to get others to accept points of view, decide or stop procrastinating may be hard. Earth signs - you set boundaries and want things planned usually - this may be a frustrating time. Air signs may love all the extra dialoguing and creative thought that could come out of it. Patience is the hardest thing to muster sometimes. We want what we want when we want it - just like kids. As adults we are supposed to be more mature and wise than that, and we are ...sometimes. Now. when we are impatient for love, wealth or travel we try to change our thoughts to manifest it. But craving and impatience aren't manifesting energies. They are addiction energies. If we want things to come to us that we desire we have to truly believe we deserve it, be ready for it on a deep level, and be able to handle it and allow it in when it arrives. This path does work when you understand what kind of energy you must hold for it to work. But it is just that - a lot of work. trust in the Divine timing of the Universe - which is beyond our control. This is a position of patience and faith. It also is a path of wisdom because the wise know we do not find love every day or with whom we dictate. Wealth takes work, and the wise know that you work all your life to be an overnight success. Travel takes money and planning before the spontaneity comes, and other major decisions usually take a lot of little things coming together at once. Everything has it's time. We know this yet we can't seem to stop judging ourselves and others for not having everything happen presto presto! If something takes time, people start projecting onto you that it must not be "meant to be " or that you are doing something wrong by not "attracting" it yet. We look for signs and omens in every little thing to tell us if something is good or bad for us. I am certainly not dissing sign and omens, but we really have no control over the timing of many things in our lives. We can't force love, and we can't force ourselves to be ready for big changes. Ask a former smoker how many times they tried to quit before succeeding and they'll often tell you they were finally, mysteriously or suddenly ready. Readiness is an emotional state we have no control over. We know how to lose weight, but we aren't ready emotionally to lose weight. We have dating services and meet people but we aren't' ready to trust anyone. We want to succeed at our career but we aren't ready for the responsibility it will bring when we do. We want to change home, city or country but we aren't ready to let go of our old lives just yet. We want to buy a new car but we aren't ready to be everyone's chauffeur. We want to have children but we aren't ready to give up our own freedom. The examples are infinite, and the reasons are often subconscious, so being ready for the change you logically know how to make is not so obvious. We need to stop judging ourselves for taking the time it takes. We need to trust that there is a Divine timing we are not privy to, that says, hey! It's time now. You've earned this! When we get too stuck in our ruts the Universe comes along to make us change in some way. We still have a choice at that moment, but we must change. e that make the doors fling open and the path easier to walk. 2010 I had this type of Divine timing enter my life.
. I had to call the fire department and the police who came to inspect it. It turned out my new slum lords didn't' have any insurance on the building ( not good ). So I recognized this as my window. I withheld rent and moved out to my current place - full of trees and quiet :) Now I have the closest thing to country in the city. This is why my raccoons are so special to me. They visit almost every night. I missed my deep connection to Nature from childhood. I consider this domino of events a miracle that propelled me into a new life. I"m sure you have stories of your own Divine timings to share as well. it or willed it to happen. No way! We don't heal in isolation, but in community. where before there had been only despair. how can we best support each other ? I was amazed how hard it was to find a definition or a quote about "mutual support". Everything was coming up about business models, or using the word enemy in the dialogue, and I thought, how strange this is not clearly defined ! we must all have some idea of what that means to us ? perhaps we are all idealizing it or fantasizing about what a truly mutual relationship would even look like. I talk about this theme often of finding the boundaries between helping and rescuing, finding what is actually effective vs co-dependency. I will help you to grow, to become more productive, by your definitions. I will help you become more autonomous, more loving of yourself, more excited, less sensitive, more free to continue becoming the authority for your own living. I cannot give you dreams, or fix you , simply because I cannot. I cannot give you growth, or grow for you. You must grow for yourself, by facing reality, grim as it may be at times. I cannot take away your loneliness or pain. I cannot sense your world for you, evaluate your goals for you, or tell you what is best for you in your world, for you have your own world. I cannot convince you of the crucial choice of facing the scary uncertainty of growing vs the safe misery of not growing. When I begin to care for you out of pity, when I lose trust in you, then I am toxic and inhibiting for you and for me. You must know that my helping is conditional; I will be with you, I will hang in there with you as long as I continue to get the slightest hints that you are taking action to heal. encouraging positive actions as defined by that person's goals and reality. This is the piece we most often miss. Most of us project what we think will help, or change the person's life for the better. But how can we know ? The soul is intricate. The longings that crave expression may be something very unusual, unconventional, socially unpopular, challenge the values of the family of origin etc. I am a firm believer that we all have something inside that is desperate to find expression, and until it does it will push on your soul and create distortions in your life. One of the hardest things in life can be answering : What do I want ? So many people freeze on this when you probe deeper. So one of the dangers when supporting someone who cannot define what they want yet is to let them have space to genuinely explore it without our great ideas ( and of course so many of those will actually be great). We can't rob ourselves and others of their process, or they arrive down the road later at the same damn place as before...but with more regret the next time. It's more helpful int eh long term to listen and hold space for someone to birth themselves - as frustrating as it can be for the listener sometimes. I also found number 9 very helpful in my own journey. honest with ourselves when we help as to our true feeling and vision of that person. must accept. having someone go against the acceptance of that type of issue is very destructive to us. We have to be able to do this without hurting ourselves. If we are the one needing support we deserve this from the ones we receive from as well. You deserve a patient ear, a consistent friend, true understanding and empathy, and a cocoon to emerge from. We are in such times my friends. Find your true supporters, even if it's you and your own higher power or Nature. Soon we will all emerge as butterflies. Even experts can't be 100% sure if someone is lying or not. We are all subtle creatures when it comes to masking our true thoughts and feelings from one another and even from ourselves. The journey to trusting again after you have been around the block in life and have been back stabbed or mislead can be very tough for most of us. view of the world that people are good until proven otherwise, and walk through life trusting blindly. This is also not great, because you can easily be taken advantage of. The answer is in the middle. Instead of getting lost in theories and strategies of who to trust, try trusting yourself! When we are betrayed, we feel hurt not so much because of the other person. The main source of suffering is self reproach that we didn't see it coming, or ignored what our intuition was trying to tell us. another person if you own your own feeling. Many people get stuck here. If you just don't want to sit next to someone on the bus, it doesn't mean you are saying he or she is a bad person...just that you are not comfortable sharing space right now, or not with them. There are so many subtle and complex sensations we receive all the time that we cannot process it all and deduce...we have to get an overall feeling and act. The more I have trusted my own intuition the more detailed and subtle it has become, and by deciding to trust for a moment that I'm right I have turned my attention away from the " maybe it's because of the weather or something i had for lunch, or because they look like my ex . ...type of thinking, and into the deeper layers of what I am sensing. I decided to trust myself and tested out what senses turned out to be accurate and which were my own fears and projections. You can too. Next time you get a gut feeling and start wondering why or feeling guilty for having it etc. Decide that moment for this instance...I am right. Then ask yourself for more information about your sense. If you get a creepy feeling on the bus, ask yourself where you feel it ( your head aches? you are tense? your heart rate just shot up?) ask yourself what other things you can sense about this person, not to judge but to acknowledge your senses. Sometimes you will be able to verify them and when you turn out to be right your paradigm of life can change in a very good way. and meet others on the same journey! After all the positive feedback I got about last month's article, I decided a follow up would be helpful as well. So this segment will go into another common behavior you can spot in a narcissist. You will often see a narcissist with a following of some sort. If they are highly educated, for one example, they will not surround themselves with peers so much as people who are not at their education level. They need to be right, and admired at all times - so they have followers or minions more than friends. These folks will stay by their side, do them favors, praise them and take their abuse - often while apologizing to them! sense a shift in the narcissists' mood and try to fix it and praise them. have spotted a true narcissist. as if I'd lived here before. I know it's the first of many visits. 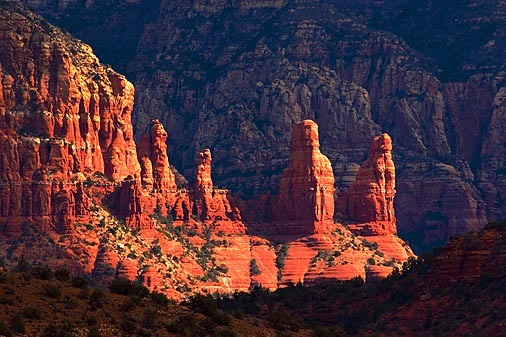 Sedona was settled at the turn of the century by Carl Schebly. He established an eleven room truck stop and hotel for the people on the long journey between Flagstaff and Jerome. Eventually Schnebly thought this place should have its' own post office, so he set out to make it so. When asked what name to put on the town he gave Schnebly Station, and Oak Creek Crossing - both too long to fit on a postage stamp. So he named it after his wife, Sedona who ran the post office. Today that same truck stop is a gorgeous resort called, Los Abrigados. Los Abrigados hosts an arts and crafts village to die for called Tlaquepaque. This was named for the man who built it after the most beautiful Mexican architecture in the villages he saw. It was built as an artist's community and the name literally means -" best of the best"- and it is. You would never guess it was only built in the 70's verses the 1800's. The whole city is full of art. There is art and sculpture everywhere, embedded in the buildings and roads, show cased in front of every gallery, restaurant and hotel. He is another interesting Sedona story. Originally a sculptor he was asked to paint portraits. He captures the Navajo so authentically you would never realize he is a white man. The impact and trust he has obviously gained with the Aboriginal people of this land is inspiring. One other amazing thing you will notice about Sedona is the gem stones and jewellery! If you love these, you may have heart palpitations as I did. The area is known for its turquoise, copper and chrysocolla. There was a beautiful variety of work to be had. One type I liked most, and bought, is a technique called embroidery which sets very delicate small stones into a silver mandala style design. This style is from eh Hopi or Zuni tribe. In this area there is Navajo, Hopi and Zuni. To the North at the Grand canyon was the Hualapai - people of the tall pines - who own 108 miles of the Grand Canyon and operate the Skywalk, tours, helicopter rides, boat rides along the Colorado river, and a gift shop where I made sure to get sage and sweet-grass from them. By far the main attraction though is the beauty of the red rocks and the energy vortexes they create. This was an ancient ocean, and the waters receded much like a whirlpool effect when you watch the water drain from our sink. The swirling water left this sandstone rock, filled with iron that give it it's redness, and with remnants of the swirling vortex energy. I first thought there would be people climbing these rocks every day, but it's not safe. The sandstone will break easily - although many try and they lose a few people a year from the attempt. There are hikes and trails though that can take you to the vortexes. There are four main vortexes and they have all been measured as to whether they carry masculine, feminine, or balanced energy. I got to hike up to the Airport Mesa vortex - the high peak where everyone drives up every night to see the sunsets ( amazing!) and a masculine energy. While hiking I definitely felt the shift in my body. Areas of sensitivity dropped, or disappeared. Emotions and insights came to me faster as well. I will be posting my YouTube video of the hike to this vortex soon! There are many healers and Intuitives , shamans drawn to Sedona every year to meditate and heal with the special energy. I visited two mediums/ healers who were very authentic. Both helped me immensely in ways I have found hard to find here in Montreal. Amidst all the beautiful shopping and jewellery I chose a piece by a man named Broken Arrow. I looked at everything for two days and his work stood out, but mainly it was the feeling I got when the vendor mentioned his name. I could feel the pain in the name. When I cam e to buy a pendant from another vendor I asked his story. I was right. He lost his parent before the age of five and was adopted by the Navajo people. He was taught silver smithing and made his own jewellery. He became a waiter in the town and people would buy the jewellery right off his body. He was about 17 when people kept telling him he should quit the restaurant work and go train fully to make jewellery...and he did. Each pendant has symbols for sacred feathers, water, protective shields and the sun. Each one unique. Now he is 76 and takes care of his wife who is struggling with Cancer - the jewellery is his therapy and his livelihood. Before I left on my trip, I got a message from my own guides to bring along a piece I made with crow feathers and gems. I at first thought it would go to someone in the Grand Canyon, but once I heard about Broken Arrow I knew it was for him. The owner of the jewellery shop have sent it to him for me, and I hope to hear back from him. And that is my Sedona story ! I have many other Sedona stories to tell. It was a transformational trip and spiritual experience that I hope to share with all of you. There were far too many guided messages, "coincidences " that happened while there, insights into my life and changes to my lifestyle that came effortlessly. Hearing everyone's personal journey to leave one life behind, heal and be guided to live there inspired me greatly. So much so that I am organizing a Spiritual retreat this fall! nonverbal cues that help sustain rich and meaningful attachments. other species on the planet, and we're hardwired to read all 43 of them. simply throw away precious real estate." and some argue that the ability or willingness to empathize is on the decline. oneself in anothers' shoes) among college students from 1979 to 2009.
as we know it kicked into high gear. Aren't you craving better conversation? Do you miss the days we had time and no facebook or texting and just sat face to face in a park? I sure do. We are creating a generation of intimacy impaired kids in my opinion. "Relating" to a screen is not a relationship. It's a form of isolation in truth. We will never replace actual human contact or touch. The part that frustrates and scares me most is that the further removed from relating emotionally to one another we become, the more depressed, socially awkward and government/ advertiser controlled we also become. We must make sure we never lose the art of a meaningful conversation. I am a part of the cyber world like most of us. I partake in facebook, I text, email, and call less and less. Personally it's because it's become the fastest or most efficient way to reach people. It's very handy to plan, or if you're running late. It' s fun on bad days to send a text to a friend and no one will know your "conversation" so you can have a running thread or window into your friends' life in a new way. What I find tiresome is the LOL! OMG! and CU L8R's...let's not lose our ability to write and speak in full sentences. We seem to all be so overwhelmed, over excited, ADD or what have you and are speaking and relating in sound bites like infomercials of ourselves. When faced with a dinner, a walk, time with no distractions...do we still know how to converse? I don't see it much. So many of us are DYING to talk and be heard. So many of us can't stop talking about our lives so quickly to relate in those minutes and seconds between things at work or even at home that we aren't even really listening let alone feeling anything while we share. There's no space! Instead we live in the voyeurism of Facebook. Don't get me wrong, I've heard and experienced some lovely reunions with people via Facebook, and it' sure cheaper than all the long distance $ it would take to chat to Australia or Seattle from Montreal. But I long for face time that is grounded, calm, empathetic...stimulating the brain in a creative way vs an adrenalised way. I've had some real conversations this summer from starting an Artist's Way group. We met in a park and talk for three hours about art and creativity, themes that come up are organically explored. We are honest in our sharing, open in the flow vs controlling the flow...and magic is happening! Insight is coming, decisions are made easily, bonds are made that stay all week and beyond. We are sorely missing these kinds of dynamics in our modern society. So I say have your twitters and I-Phones, but only as an enhancement to your intimate relationship, or as a business tool....not as a replacement. If your friendship only exists in cyberspace you are in trouble. How do you even know if you are compatible in basic human ways? Maybe you can't even walk down the sidewalk without wanting to kill each other? Maybe all that funny, witty or deep conversation only happens when the chat requires two people actually take turns talking? What happens if you can't handle emotions when with someone? We must never lose the art of conversation and intimacy. We can't let our society be eroded to the point of not feeling for others. Please, reflect this month on your usage of technology and the quality of your relationships, and change what's necessary. Push yourself to be outgoing with people in person. Let your feelings show to your friend vs crying behind a computer screen when no one can see you. It's crucial to your emotional and psychological well being, and to the evolution or devolution of our society. Think about it . In both cases, what that writing and talking is really about is inflating the ego.